4865 ✉ 615/16 25 Pfg. 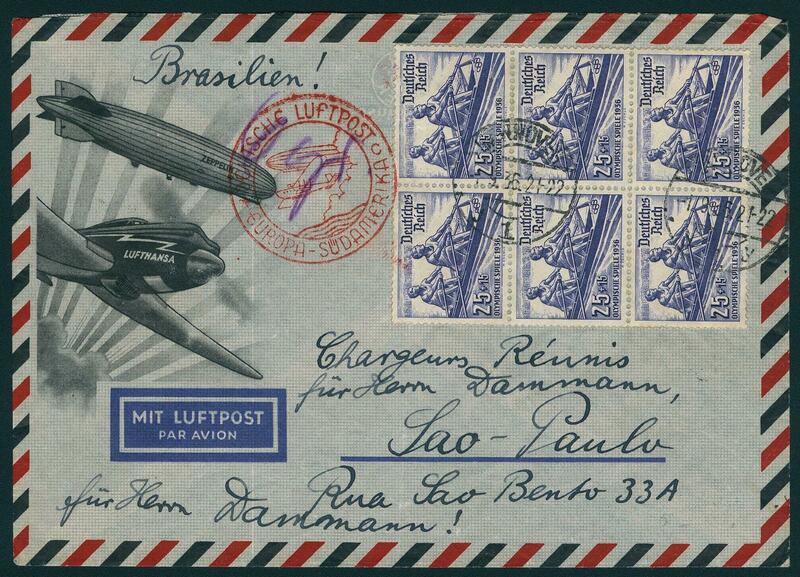 Olympic games 1936, block of six with on the back additional franking on very nice air mail letter from \"Hanover 1.9.36\" to Sao paulo / Brazil with red special confirmation stamp the airmail and arrival postmark. Very decorative! 4866 Bl.4XU Brown ribbon souvenir sheet 1936 unperforated in full original size mint never hinged a few minimal as usual gum creases and slight edge tints are insignificant. 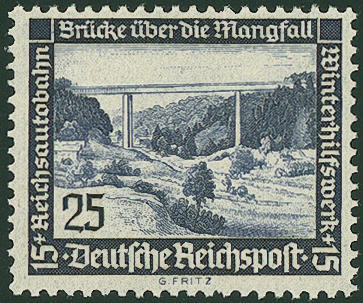 A very attractive copy this large German Reich rarity, from which only a few copies became known are. Expertized Köhler, photo expertize \"there are so far only a few examples known\" Hans-Dieter Schlegel BPP. 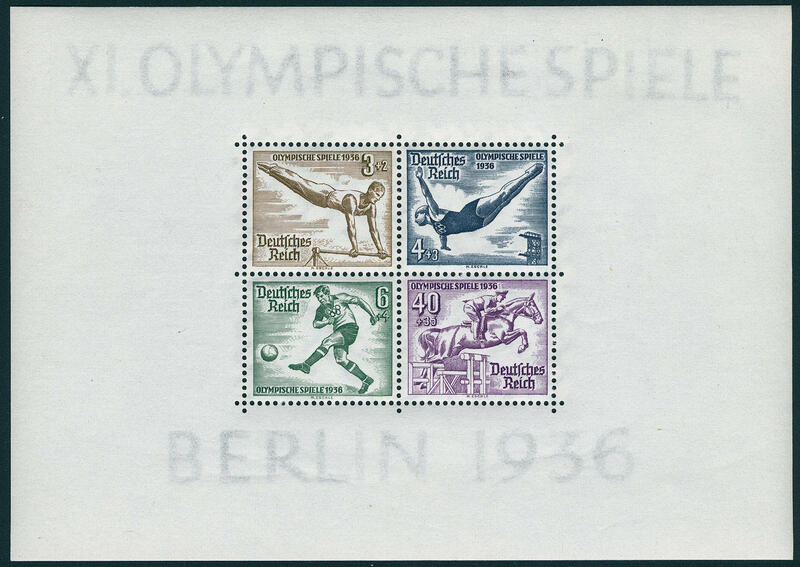 4867 Bl.5/6 Pair of olympia souvenir sheets 1936, fresh colors and in perfect condition mint never hinged, without any signs. Michel 260,- €. 4868 641x 25 Pfg. 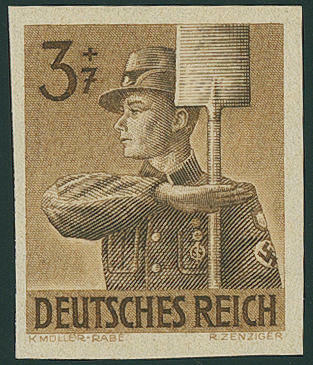 Winter help work 1936, scarce vertical gum rippling, in perfect condition mint never hinged, expertized Peschl. 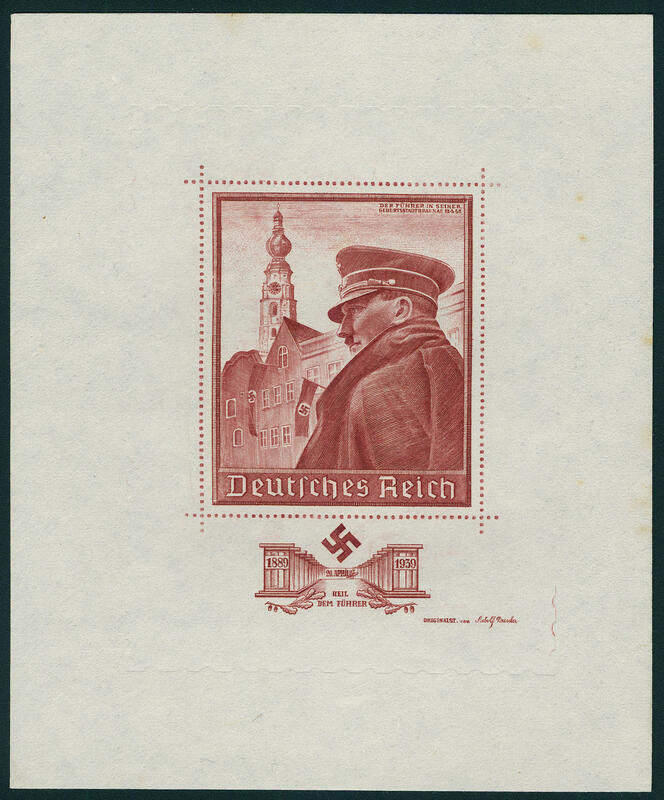 4869 Bl.7/9,11 Hitler, all fours souvenir sheets, fresh colors and in perfect condition mint never hinged Michel 930,- €. 4870 FDC 651/59 Winter help work set 1937 ships, all nine values in perfect condition on two beautiful first day letters with philatelic agency cancel \"BERLIN 4.11.37. \". Michel 500,- €. 4871 ✉ 672x 6 Pfg. 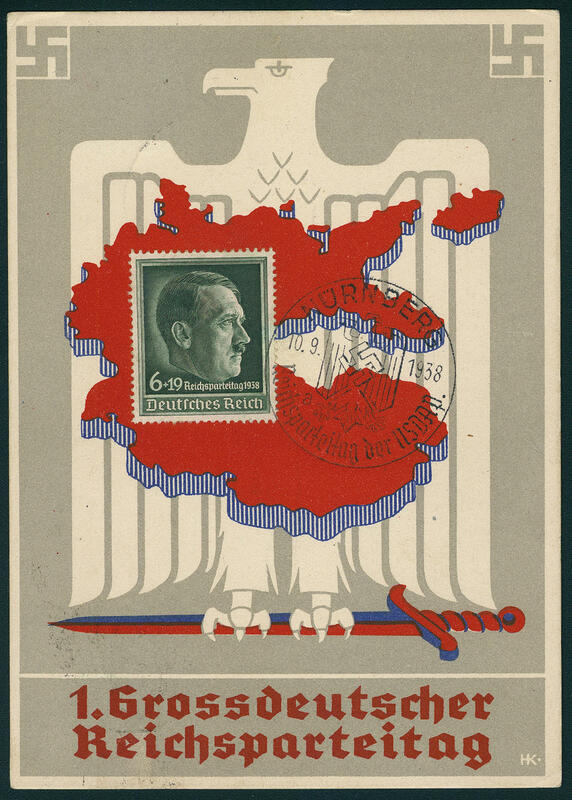 Nazi Party Congress 1938, on face on propaganda card to the 1. Greater German Nazi Party Congress with special cancellation \"Nuremberg Nazi Party Congress of the NSDAP 10.9.38. \". Rare! 4872 ⊙ 672y 6 Pfg. Nuremberg Nazi Party Congress 1938, the scarce horizontal gum rippling, fresh colors and very well perforated from upper margin, unfolded with special cancellation \"Nuremberg\", photo expertize \"the quality is perfect\" Hans-Dieter Schlegel BPP. 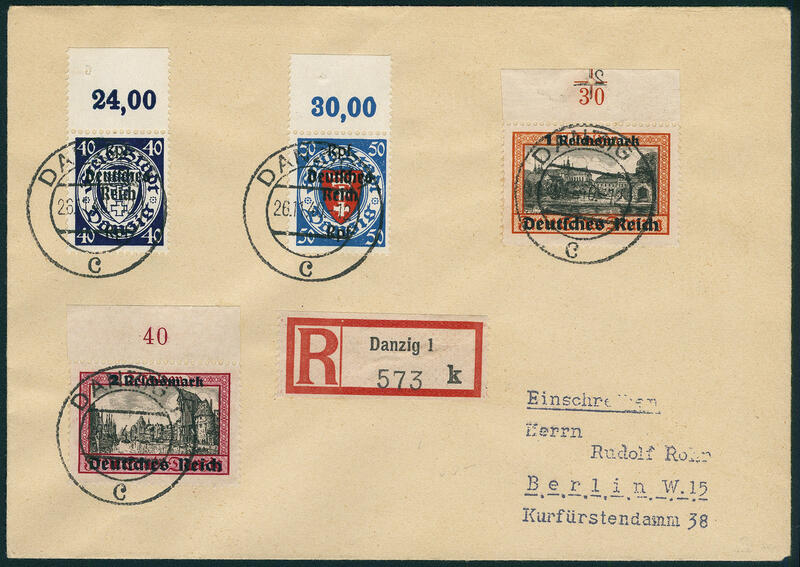 4873 FDC 675/83 Winter help work 1938 uniform from lower margin on registered First Day Cover from \"BERLIN 18.11.38. 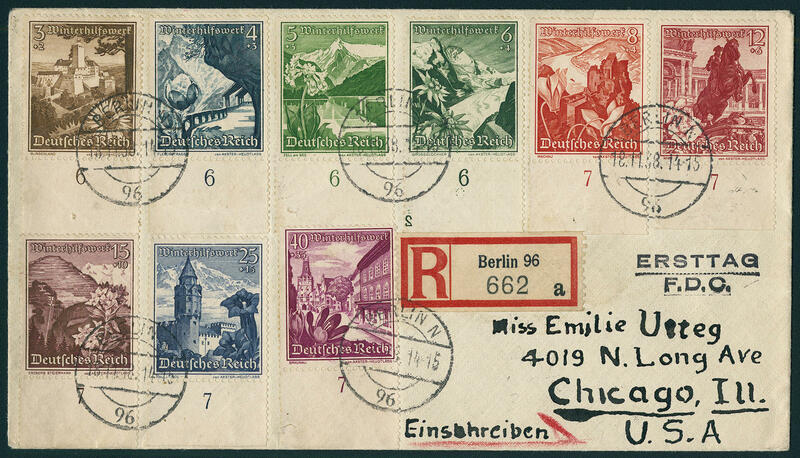 \" to Chicago / USA with arrival postmark. Rare! Michel 500,- €. 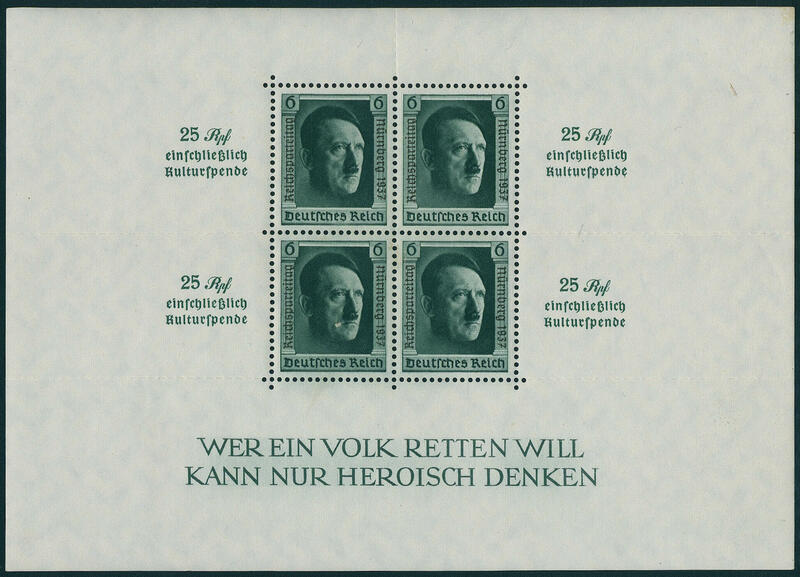 4874 691 Birthday of Adolf Hitler 1939, not official special print on ungummed paper, a few small toned spots, without indication of value with imprinted perforation. A scarce and sought issue! 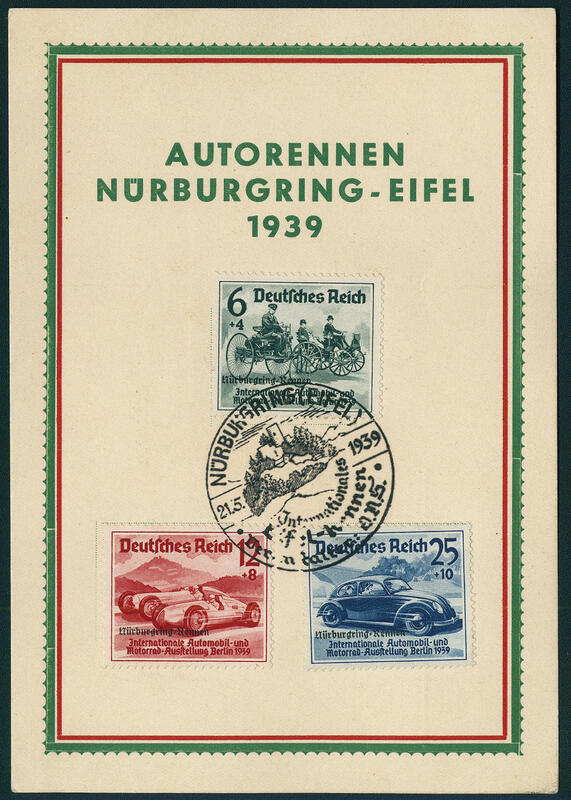 4875 ✉ 695/97 Nürburgring 1939, faultless set on very nice accordingly special card with special cancel \"NÜRBURGRING 21.5.1939\". 4876 ✉ 728Pl.Nr. 1 RM. Danzig-departure from upper margin with plate number 2 in mirror writing, in perfect condition with additional franking on postage exceeding tariff rate registered cover from \"Gdansk 26.11.40. 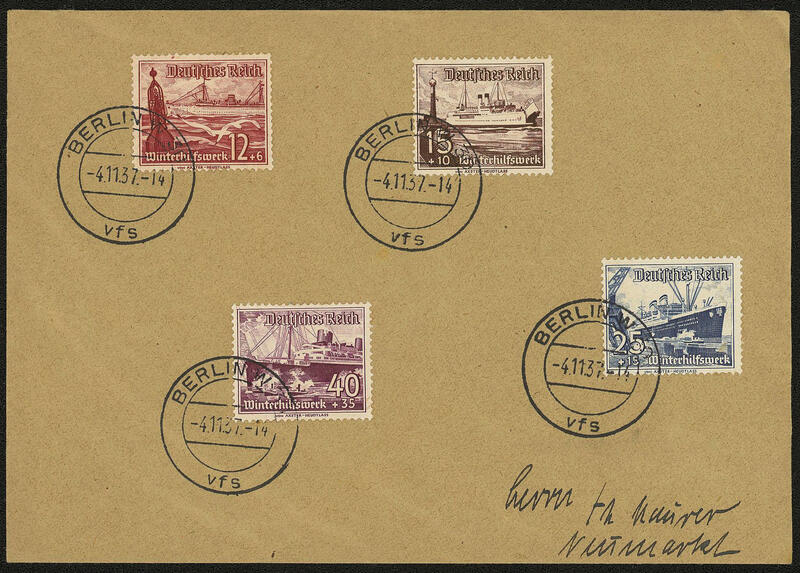 \" to Berlin without arrival postmark. Plate numbers the Mark values are anyway rare and become also mint never hinged by Michel only noted without price. The mirror-inverted plate number 2 at the 1 RM is up to now by Michel unknown. In this kind a rarity! 4877 FDC 781/98 1 - 80 Pfg. 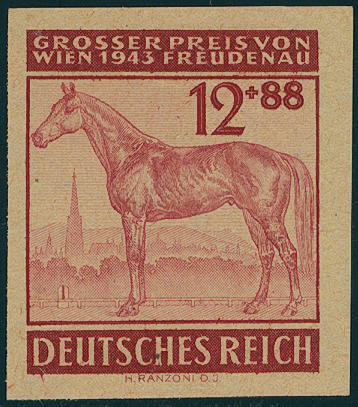 Hitler 1941, all 18 values (42 Pfg. Was first 1944 issued\" on 6 faultless first day letters with philatelic agency cancel \"BERLIN 1.8.41\" in perfect condition. Rare! 4878 788Abart 12 Pfg. 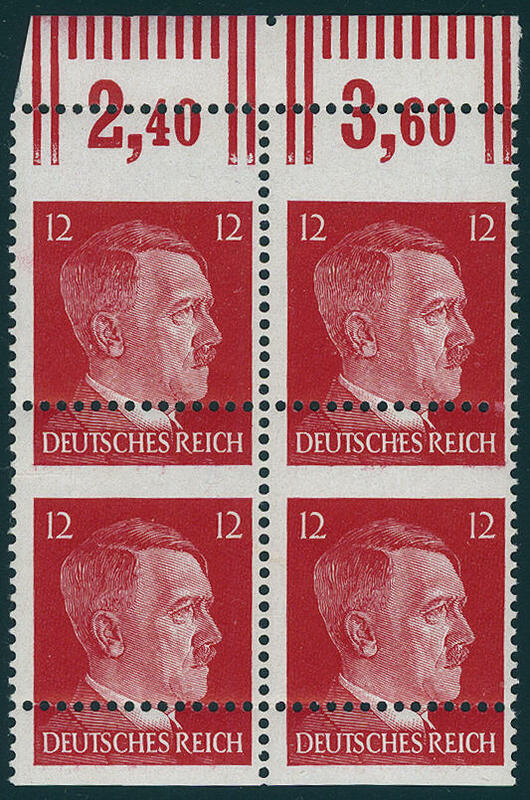 Hitler, block of four with extremely strong defective or badly placed perforation from upper margin, in perfect condition mint never hinged, only from upper margin slight affixed spots. A decorative and in this distinct form scarce unit! 4879 799PIII 1 RM. 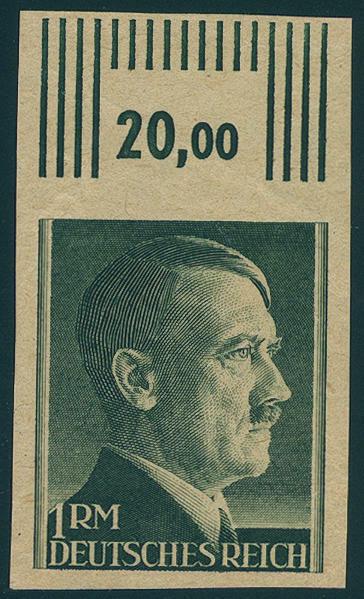 Hitler 1942 as cut proof on thin, yellowish, ungummed wood containing paper from upper margin. By Michel only noted without price and from upper margin very rare! 4880 801B 3 RM. 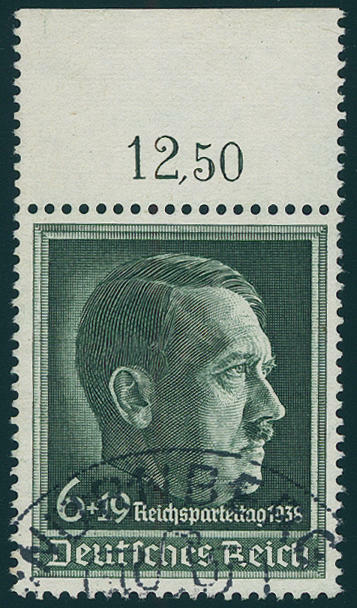 Hitler, the good close perforation in the complete original sheet to 25 values, twice prefolded, all values in perfect condition mint never hinged Michel 750,- €. 4881 VK 815Probe 42 Pfg. 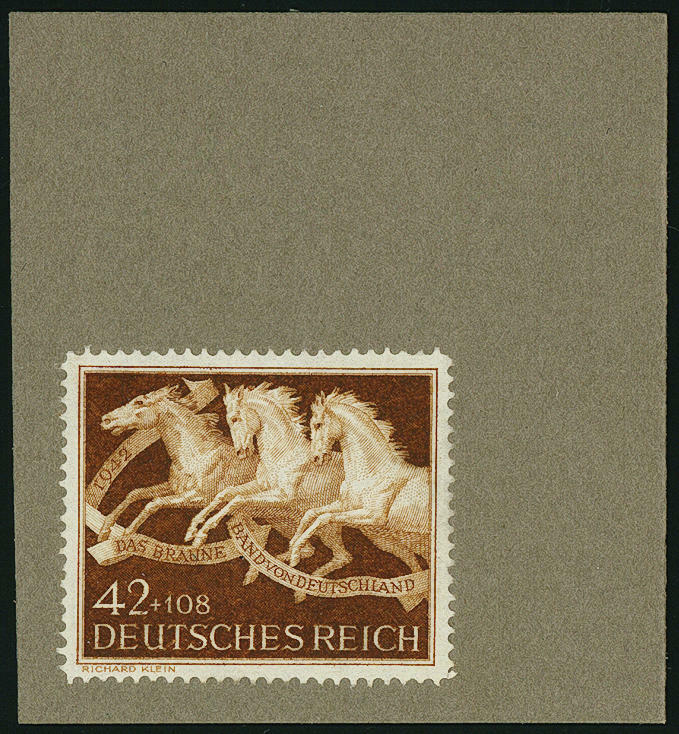 Brown Ribbon 1942, proof in ochre-brown in lieu of dark yellow brown, perforated L 14 1 / 2, fresh colors and in perfect condition on specimen cardboard. 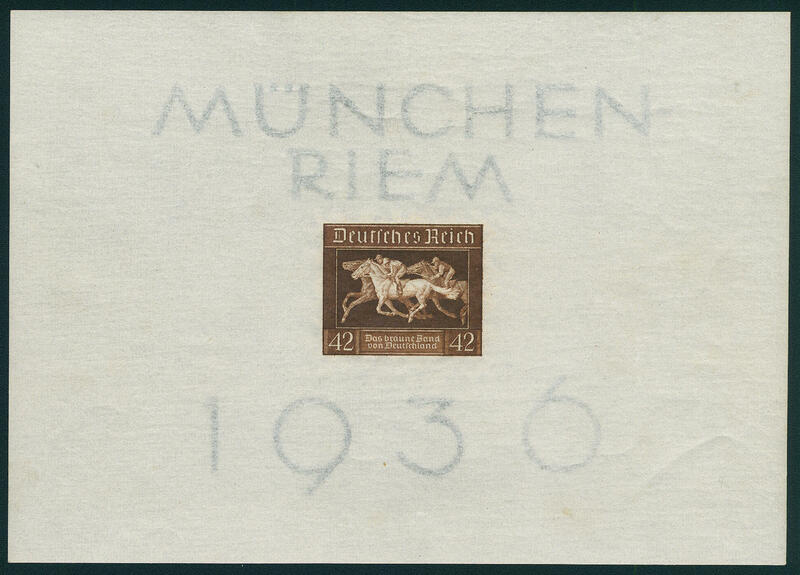 An extraordinarily rare proof from the Empire printing office Vienna. Photo expertize Ludin BPP. 4882 820U 3 Pfg. 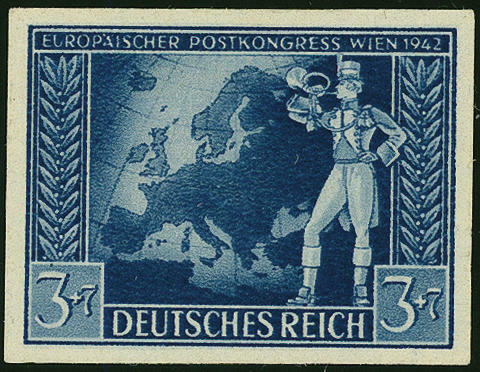 European Postal service congress 1942, four sides with wide margins unperforated, fresh colors, in perfect condition unused with original gumming. An extremely scarce variety, the also in the Michel special catalogue unlisted is! Expertized Schlegel BPP. 4883 850U 3 Pfg. 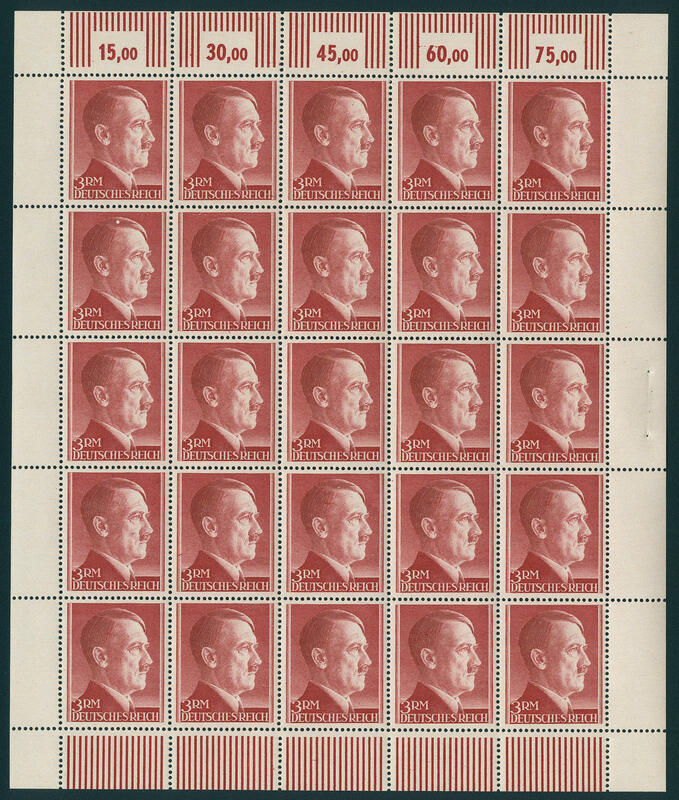 Fatigue duty 1943, four sides unperforated, in perfect condition mint never hinged, expertized Ludin BPP, Schlegel BPP. 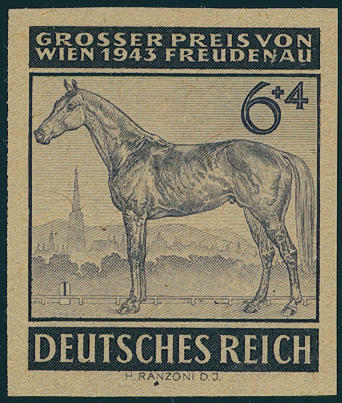 4884 857/58PI Horse racing \"great prize of Vienna 1943\", unperforated proof copy series on thin, yellowish art paper, fresh colors and with wide margins, in perfect condition, expertized Ludin BPP. Michel 400,- €.